PA Systems - Your Ultimate Guide from Andertons Music Co. Without PA systems, we'd live in a world of silence...almost, anyway. Whether you're looking to purchase your first PA setup, or upgrade an existing one to the next level, we've got you covered! Read on for the full lowdown! PA systems aren’t just tools of the musical trade; you’ll find them everywhere, whether it’s a local event, a school hall, a yoga class, an open-air gig, or anything in between! Luckily, advances in technology mean that there are now various types of PA setups that are designed to cater for every requirement. In this article, we’ll take a look at the different things that you’ll need to consider if you’re looking into getting a system. This includes the different types of PA systems that are available, the typical components you might need, the technology behind them, and much more! Shop Live & PA Now! It sounds like a simple question, but we figured it'd be worth going back to the drawing board. In literal terms, PA stands for public address - the idea behind a PA system is to provide basic amplification to whatever you want to amplify. It could be a band, it could a single microphone for public speaking, it could be a backing track...it's up to you! Your PA system is your means of taking your sound and delivering it an audience! Nowadays, PA systems come in many different forms. You'll most likely have an image of big speakers and lots of buttons to play with - but there are plenty more options available, including portable, compact, and package systems designed to suit every need! Speakers - we all know what these do! Different speakers are designed to handle different wattages and project sound in different ways, depending on your venue or audience! You can get passive (without power) or active (powered) speakers - we'll go into more detail on this later in this article! Mixers - the mixer acts as the central hub of the setup, controlling what goes in (microphones, instruments, computers & other sound sources) and what goes out (how many amplifiers, speakers, headphones and so on). You'll find mixers vary in size; the bigger the mixer, the more inputs, outputs, faders, controls and options it'll have! Amplifiers - these are only required if you have high-powered/a large number of passive speakers that need a signal boost. The signal from a mixer could be considered relatively low, so a power amp will boost it to produce higher volume and clarity for larger setups! If your speakers are active, they'll be able to amplify themselves, thus omitting the need for an amplifier. Cables & accessories - it may be obvious, but the types of cabling and accessories can often determine how effective your setup will be. You'll need to consider specific cables to handle the power of the speakers, as well as stands, bags/cases and adapters among other things! These are usually the essential elements for a fully-functioning PA system, but it's worth noting that some systems combine these aspects for more compact or portable applications. Microphones - some PA system packages come with microphones included (more on this later), but there are many types to consider. Dynamic handheld mics for vocals & speaking, headset mics for easy mobility, instrument mics for live performances and so on! Monitors - PA systems are great at sending sound outwards to your audience, but it can sometimes be hard to hear yourself on stage or behind the speakers. Monitors are smaller speakers that are designed to face the performer / speaker to feed some of the sound back - particularly useful at loud events! You'll often several of them lined up across large stages. Subwoofers - as you may have guessed from the term sub, these control the bass frequencies of your sound. Most speakers have built-in subwoofers, but for larger systems you may want a dedicated bass-boost! Stage / DI Boxes - having lots of instruments, microphones and sources leading to a mixer can make for a messy, unsafe stage setup. A stage box can put extra distance between the mixer and the stage, allowing you to tidy up your cables on stage whilst still being able to connect them to your mixer and retain sound quality. A DI box takes an unbalanced signal from an input and makes it balanced - louder, clearer and without noise! Effects - also called outboard effects, these allow you to change the quality of your sound to a great extent than your mixer will. Add EQ settings, reverb, delay, modulation and more! 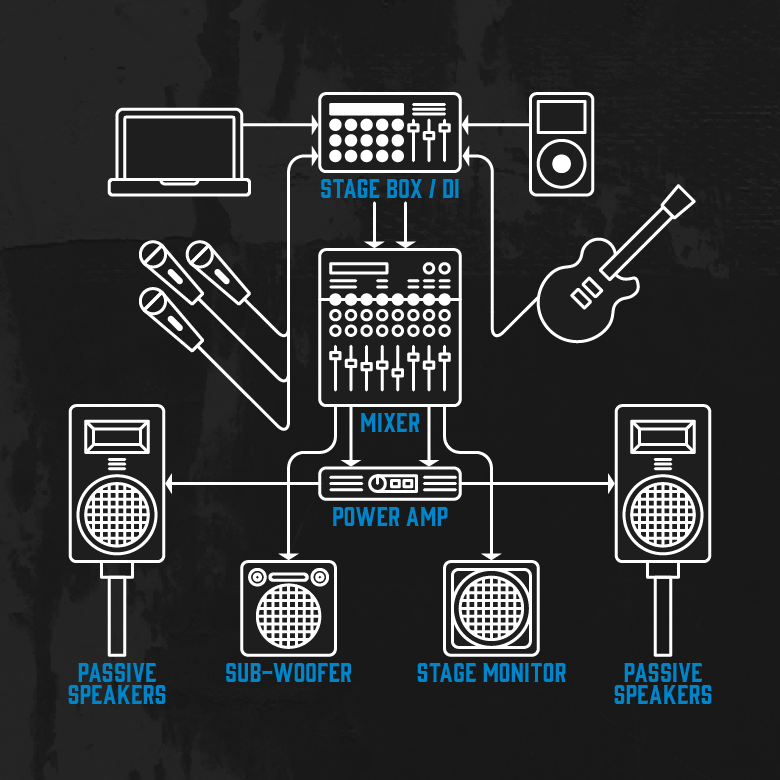 Now that we've covered the basics of what a PA system is and how it works, let's take a closer look at the essential parts of the setup! Mixers, Speakers, Amplifiers and Accessories! As you may have already gathered, there are many levels of detail you could go into when it comes to PA systems. However, the four main aspects of a setup largely remain the same. As long as you have these four aspects (in some form), you'll have a working PA system! Without speakers, there'd be no noise whatsoever - so we thought we'd start with them! PA speakers come in all shapes and sizes, and your requirements will likely determine the one(s) you choose. Passive speakers have no built-in power supply, so need to be powered externally to make sound. This is usually achieved with a power amplifier that can power multiple speakers. Passive speakers are usually better if you need either a large system or are looking to expand in the future, as you can easily power them all using a small number of power sources. They're also a lot lighter due to a lack of built-in electronics, meaning they're easier to cart around in bulk! This means that these speakers are powered at the mains, usually with their own on-off switch, volume control and extra connectivity options. Because the power and amplifier are built-in, active speakers are far easier to set up and more practical to connect to various sources. They're ideal for smaller setups, as each speaker needs its own plug point, and you don't need to transport any extra power components or cables to use them! Wattage - to put it simply, the higher the wattage, the louder the speaker will go. Many speakers on the market hover around the 1000W mark, which will pack enough punch for many events up to 1000 capacity. If the size of venue, size of audience or number of input sources increases, more wattage will likely be required. Size & Weight - whether you're moving your PA speakers from the store room to the stage, or carting it halfway across the world, you'll need to consider the practicality. Do you want active speakers that require fewer parts but are slightly heavier, or are you happy with lighter passive speakers and a bulky amplifier? Sound Quality - naturally, many PA speakers sound slightly different. Some have a bigger low-end emphasis, some work better at louder volumes, and so on. This entirely depends on what you'll be using it for; will you be doing public speaking at low volume? Low-end and loudness may not be your priority, but rather clarity! Worth noting: Does my PA system need a subwoofer? This is a question that may have already crossed your mind. As mentioned earlier, a subwoofer highlights and emphasises the low-end frequencies of your mix - a good amount of low-end goes a long way, but at what point do you need a dedicated subwoofer? Although a bass-heavy sound can be attractive, it's not normally the most common reason for adding a subwoofer - when you incorporate one into your setup, you spread the frequency workload more evenly, thus alleviating some strain on your main speakers. This often means better clarity as well as more pronounced bass. So you can pump up that volume a little more without worrying about losing quality! Shop All PA Speakers Now! As we mentioned earlier, the mixer is the central hub of your PA system - the mothership, if you will. It'll control what goes in, what goes out, the volumes of each independent aspect, and so on. The mixer you'll want will depend on the usage you want to get out of your PA system; if you need a simple setup for smaller events, a small mixer with 10 channels or less will suffice. However, if your venue is larger, or your system is for a large musical ensemble, you'll need more inputs and possibly more outputs, meaning a bigger mixer! Inputs - as we've briefly touched on, this is essentially the number of things you want to amplify. If it's just a public speaking event with a handful of mics, or background music, you'll only need a handful of inputs. If, however, you're mixing a live gig with a big band or choir, you may well need a higher number of inputs to cope! Outputs - as the term suggests, this is the number of things you want the sound to travel to. Speakers, subwoofers, headphones, monitors, direct line-outs for recording and so on. Most basic PA setups will have a handful of outputs, and a separate headphone output so you can listen closely to the mix. If your venue is larger and you require more speakers, more outputs will be required. Extra Connectivity - bluetooth, USB, internet...you get the picture! You may want additional connectivity options if your rig is closely linked to a computer, for example if you're using backing tracks. Bluetooth is also immensely useful if you're frequently changing between backing tracks/playlists and a live mix...or if you're DJing at a wedding reception and somebody has a request! Effects - not essential if you're organising public speaking or a dance class, but for live music mixes, a little reverb and delay can be immensely useful. This is mostly applicable to live vocals, which can otherwise sound a little dry. Practicality - as with speakers, bear in mind how often you'll need to be carting your mixer around. If you're expecting to be frequently setting up and packing down, then a lightweight monitor may be ideal. Whereas if your mix involves a lot of inputs & outputs, you may have no choice but to bite the bullet and get a monster mixer! Faders - as you may instinctively know, this controls the volume of a channel. Take note of the clipping level, often indicated by coloured LEDs: green means quiet/sensible volume, amber means loud and prominent, and red means too loud/distorting. Avoid the red at all costs, and aim to tread between green and amber. Gain - this controls how hard you're driving a preamp signal. To most people's ears, adjusting this will increase or decrease volume, but as it controls the preamp, it can result in distortion at higher levels. Be mindful of your gain levels to avoid this, and instead use the main fader to control volume! EQ - short for equalisation, this will control the shape of your sound. It'll often be split into at least 3 separate knobs for high, mid and low frequencies. For example, if you're mixing a cello, you'll want to boost the low frequencies, whereas if you're mixing a violin, emphasise the mid & high frequencies. Pan - this controls where your signal sits in a stereo mix. Many PA systems consist of at least two speakers, placed left and right. Adjusting the pan on a channel will determine which side it'll come out on! It's not just a case of one or the other - panning can be adjusted by small amounts to find the perfect stereo placement. +48V - this is your phantom power. It's used to power dynamic microphones, which won't work without it. Be cautious to only use it with mics that need it, as you can damage or completely destroy more sensitive microphones with this feature! Aux - short for auxiliary, this controls the level of signal going to other outputs. For example, you may have a signal going to stage monitors, or a recording device. Many manufacturers now offer all-in-one systems that combine the functionality of mixers, amplifiers and speakers into one unit. This makes for an extremely practical solution for smaller events, in that you hardly need to worry about size, weight or setup time - because it's all been taken care of! You may be thinking 'does my PA system need a power amplifier?' This question is easily answered by which speakers you'd like to go for. As we've already discussed, a power amplifier is only really required if you're using passive speakers. A PA power amplifier is what provides power to speakers that don't have their own power supply. It can often allow greater control over volume and increased clarity, plus it's more practical if you have a large number of speakers; fewer power points are required to run your system! How Much Power Do My Speakers Need? The general rule of thumb is that you need to be able to provide around double the handling power of your chosen speaker. So for example, if you have an 8-ohm speaker with a program power rating of 350 watts, you'll need an amplifier that can pump out 700 watts at 8-ohms. This may sound counter-intuitive, but it's aimed at preventing distortion of your signal. If an amplifier can produce double the amount of power required, the signal will be able to reach a far higher volume without clipping, because the amp guarantees plenty of headroom! Many power amplifiers power two channels, i.e. a stereo PA system, but you can get ones with multiple channels for larger systems. Again, this may be more practical if you're planning on having a PA with more than two speakers or spanning a larger area. As the name might suggest, a powered mixer combines the functionality of a mixer and a power amplifier. This means you can achieve the mix you're after and reach higher volumes without distortion, using just one unit! This can be more practical if you need a quick-setup basic PA but with a little extra projection / if you're not too keen on lugging too much around! Shop All Power Amps Now! It's all very well and good having the key elements to your system sorted out - but without the accessories to tie them together, you won't get very far! Whether it's carry cases or bags for the different elements of your setup, or crucial things like cables and stands, there's plenty to consider. The good news is that it comes in a little more affordable than some of the stuff we've already discussed! XLR - this three-pin connection is most commonly used to connect microphones to systems, but you'll find it can also be used to connect other input sources, as well as connecting certain speakers to mixers. 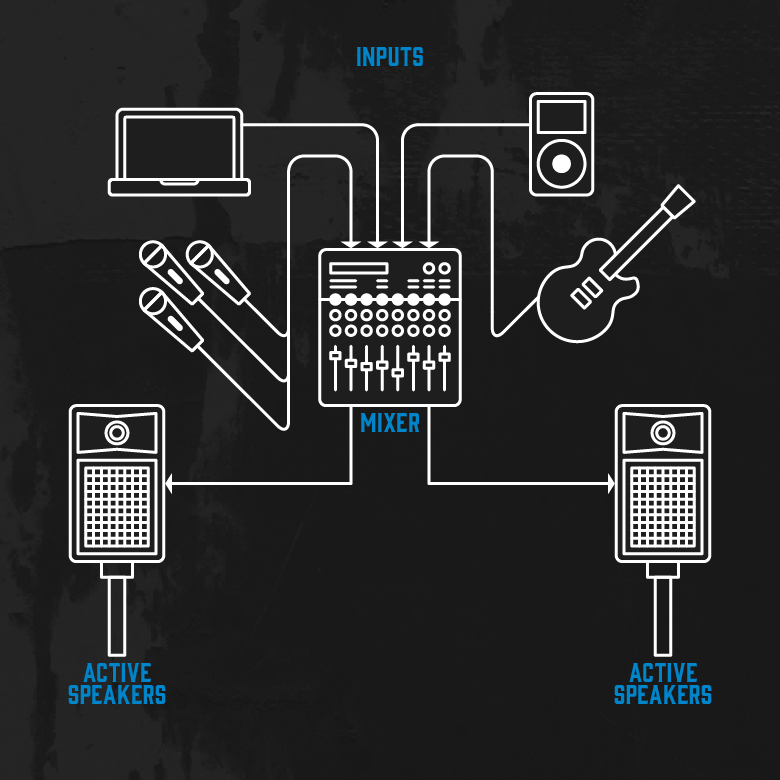 Many active PA speakers can be connected to mixers using XLR. Its two main benefits are the fact that it carries a balanced signal (isn't affected by electronic or static interference as badly) and it can transmit 48V phantom power for use with microphones. Jack - also known as TS (mono) or TRS (stereo), these are often used to connect instruments to inputs, such as guitars to guitar amplifiers. You may find that many PA speakers or mixers do have direct jack inputs for practicality, but unlike XLR, their signal is unbalanced. This means it's susceptible to noise, especially over long distances. Speakon - these are capable of much higher-current balanced signals. Speakon cables are insulated to prevent shocks and shorting when disconnected, as well as being air-tight to prevent anything damaging your connection while in use. They also lock into their input when twisted clockwise, ensuring that nothing becomes disconnected accidentally! RCA - these connections are far smaller, and often used to connect external, low-output devices like phones, laptops, audio gadgets and so on. You'll most often find these on mixers (or some active PA speakers). An RCA connection usually requires two plugs, often colour-coded red and white, to capture true stereo. If your PA system travels with you, or spends some of its time in storage when not in use, you may want to consider covering it up. Many manufacturers offer hardcases, slip-on covers or carry bags for PA systems and speakers. Brands like Gator and Stagg offer a great range of affordable, diverse protection solutions. In order to adequately project your sound, and to ensure that you get the most out of it, you'll want your PA speakers to have some height. Again, many companies offer a range of options when it comes to PA stands and similar solutions. Shop All PA Accessories Now! As we've already mentioned, once you've dealt with the key aspects of a working PA system, there are many other things that you may wish to consider. This depends on how you plan to make use of your system; if you're looking for a system with a specific purpose in mind, or to expand an existing system, there's plenty to think about. Read on for more info! If you're planning to use your PA for public speaking, for instructing, or for any public event that requires someone addressing or singing to an audience, you may want to consider some microphones for your setup. We offer a wealth of options, including straightforward vocal mics, wireless handheld mics, headset systems and much more. We're proud to stock some of the industry-leading names such as Shure, Sennheiser, Line 6, Lewitt and Neumann, among others! Shop All Live Microphones Now! It's likely you'll encounter a DI (direct injection/input) box at pretty much any venue, studio or rehearsal space. They take an unbalanced signal, like an acoustic guitar, and convert it into a balanced signal, which is louder, clearer, more consistent and less susceptible to interference. These are extremely useful if you're concerned about cables running for long distances or if you'll be connecting instruments to your setup. Different DI boxes offer different options in terms of inputs, outputs, switching and so on. Click on the button below to view our full range! Stageboxes are essentially scaled-up versions of DI boxes, allowing multiple inputs to travel long distances to your mixer without having a multitude of cables tangling up. They'll allow you to connect several inputs to one unit, which will then carry those signals via one long cable, which can then re-connect to your mixer, providing you with total flexibility. These units will only be necessary if you're planning on using your system with a large musical ensemble, or any situation with many different inputs required. Shop All PA Outboard Now! Now that we know what goes into a PA, we'll need to consider how to put it together. As we've already discussed, PA systems can consist of lots of different elements, making them super flexible and easy to tailor to your needs. Similarly, due to the modular nature of PA system hardware, you could very easily strip it back to a very simple setup - it all depends on your requirements! The other type of setup you'll come across is often found at larger events, spaces or venues that require extra flexibility and projection. This involves more of the elements that we covered earlier in this article. Your inputs will go via DI boxes or stage boxes to your mixer, meaning you can control a higher number of input signals without miles of cables / any detriment to the sound quality. Your mixer can then go to several places; first of all, and arguably most importantly, to a series of passive speakers powered by power amplifiers. For example, if you had a larger space to fill, you may want to use 6 passive speakers powered by 3 stereo power amps - this will ensure extra volume, clarity and power efficiency. Shop All Complete PA Systems Now! You could always go one step further than complete PA systems; many manufacturers now offer setups that are compact, practical and easy to use, and some even include a built-in battery for full portability and on-the-go use. We're proud to offer some of the top options in the compact & portable PA category available on the market today, including incredible options from Bose, dB Technologies, Electro Voice and many more. These setups are ideal if you're looking to be able to make noise on the go, or if you're frequently changing venues. They're easy to setup & pack down, they boast excellent sound quality despite their compact appearance, they're subtle and won't look out of place in a formal or executive space, and they're lightweight and portable. Some even come with built-in battery power for truly portable functionality. What's not to love? Shop All Compact PA Systems Now! Does my PA system need a power amplifier? Your PA system will only need a power amplifier if you're using passive speakers. This is usually the case if you're working with lots of inputs or a larger space with bigger volume requirements. Again, a subwoofer is often only required for two main reasons: to boost bass frequencies, and to improve the overall clarity and volume of your sound. Many PA speakers produce adequate and accurate sound anyway, so you'll only need a subwoofer if you need that extra power - for example if you're playing electronic music to a larger audience! Do I need active or passive speakers? 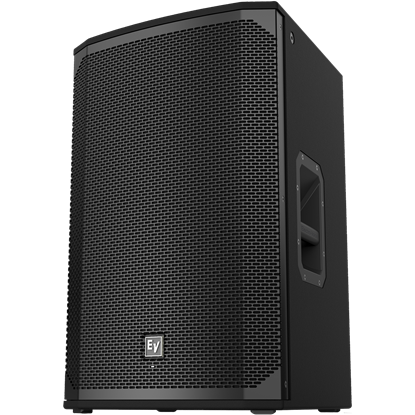 With passive speakers, you have more overall flexibility, control over levels and more power efficiency, so they're ideal for larger events where power and projection are high priority. Active speakers, however, are easier to setup (only needing power and signal from the mixer) and require less hardware, so are a little more common! What wattage do my speakers need to be? This is relatively easy to breakdown, but is mostly subjective. We'd recommend gauging it on watts per person in the audience, as follows: for spoken word, acoustic acts and small indoor spaces, 1-2W per person. For bands & medium-size venues, 3-4W per person. For larger ensembles and larger venues, aim for 5W per person. What's the best PA system for a band? This depends on the band and the context. For a small rehearsal space & contemporary ensembles of 3-5 members, a simple mixer with stereo active speakers will suffice. If the ensemble or space gets larger, having passive speakers, a power amp, subwoofer and stage monitors will drastically improve the sound and flexibility. It'll ensure that each member is heard clearly (thanks to the subwoofer & subsequent clarity) and that they can hear themselves too! What's the best PA system for a school hall? Most school halls will be able to cope with a simple mixer + two active speaker setup. Many school halls or spaces are not acoustically treated, so trying to incorporate subs, monitors and so on may be redundant. Plus you'll want it to be easy to setup and pack down! What's the best PA system for busking? You'll want something that's either compact or portable, or both. As we mentioned earlier, some systems have battery power built-in for total flexibility, whereas some modern systems offer excellent project with minimal setup or footprint. What's the best PA system for a dance instructor? Again, ideally something that's relatively compact, but it also depends on the space. Many rehearsal spaces don't require too much in the way of projection, so smaller systems will be able to cope & they'll be easy to set up. See the yoga video above! If you've been tasked with buying a new PA system, or you're considering upgrading an existing one, it can be difficult to know where to start. Our aim with this article was to deconstruct what goes into a PA setup, and in doing so, to help you understand how to approach putting one together! Ask yourself the right questions; are you an instructor, always on the move & working in small spaces? Perhaps you need an all-in-one portable system. Are you organising live sound for frequent open-space events? Perhaps the full passive speaker + power amp + subwoofer setup will be what you're after. Now that you know what's what, you'll be able to make an informed decision on what you need - and you'll be able to get it up and running! We hope you've found it useful - if you do have any questions regarding this guide or any of the products that we offer, please don't hesitate to contact us!